WE KNOW HOW Ryan Tubridy is going to be spending his weekend: the JFK Library in Boston has made its archive available online. The JFK Digital Archive was opened to the online public yesterday after what Boston.com described as a project that “only took four years, €10 million and the brains of some of the biggest tech and data companies” to establish. Boy, is it worth it. Type in any search term – place, person’s name or issue work best – into the search box here and a plethora of archival options pop up. There are 200,000 pages of text, 1,500 photos, 1,250 hours of audio and motion picture recordings and 340 phone conversations featuring the voice of John F Kennedy. It’s not the entirety of the collection but it is plenty to keep amateur historians happy for many a rainy day. 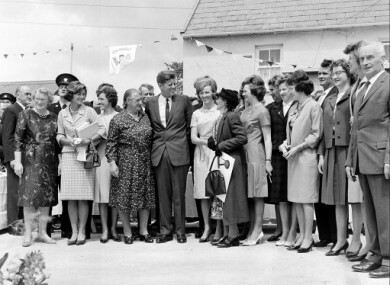 The material included goes from the highly political to the highly personal (there is even a picture of Jackie Kennedy’s bedroom circa 1962) Even typing in ‘Ireland’ into the search box generates 14 sound recordings, 24 photographs, oral histories, pictures of museum artefacts, movie footage, White House files, personal letters to Irish citizens during JFK’s visit here in 1963 and so on. Caroline Kennedy launched the online archive to help commemorate the 50th anniversary of the inauguration of John F Kennedy as US President. Email “From Cuban Missile Crisis to the First Lady's bedroom: JFK digital archive rocks”. Feedback on “From Cuban Missile Crisis to the First Lady's bedroom: JFK digital archive rocks”.